Since we are all human, it is common for managers to make “errors” when assessing employee behavior and writing performance appraisal documents. These rater errors are reflective of our unconscious biases toward the employee. These biases can give an employee an unfair advantage or disadvantage over others in their peer group. The book, Human Resource Strategy , defines rater errors as being reflective of our imperfect judgment of others. It is for this reason that it is important to understand these biases and take them into consideration when preparing a performance appraisal document. According to Dreher/Dougherty, “A barrier to the accuracy and credibility of performance measures is posed by a number of rater errors, perceptual biases and other sources of distortion in performance ratings”. So what are these rater errors? Halo Effect is when a rater’s overall positive or negative impression of an individual employee leads to rating him or her the same across all rating dimensions. This is when a manager really likes or dislikes an employee and allows their personal feelings about this employee to influence their performance ratings of them. Leniency error is when a raters’ tendency is to rate all employees at the positive end of the scale (positive leniency) or at the low end of the scale (negative leniency). This can happen when a manager over-emphasizes either positive or negative behaviors. Central tendency error is the raters’ tendency to avoid making “extreme” judgments of employee performance resulting in rating all employees in the middle part of a scale. This can happen either when a manager is not comfortable with conflict and avoids low marks to avoid dealing with behavioral issues or when a manager intentionally forces all employees to the middle of the scale. Recency error is the rater’s tendency to allow more recent incidents (either effective or ineffective) of employee behavior to carry too much weight in evaluation of performance over an entire rating period. This can be extreme on both ends of the spectrum. Either an employee just finishing a major project successfully or an employee may have had a negative incident right before the performance appraisal process and it is on the forefront of the manager’s thoughts about that employee. 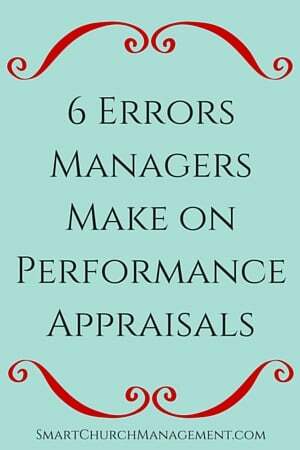 It is for this reason that keeping accurate records of performance throughout the year to refer back to during performance appraisal time is so important. First impression error is the rater’s tendency to let their first impression of an employee’s performance carry too much weight in evaluation of performance over an entire rating period. An example of this would be a new employee joining the organization and performing at high levels during their “honeymoon” period and then possibly losing some of that initial momentum. Similar-to-me error is when the rater’s tendency is biased in performance evaluation toward those employees seen as similar to the raters themselves. We can all relate to people who are like us but cannot let our ability to relate to someone influence our rating of their employee performance. Since human biases can easily influence the rating process, it is important to create objective measures for rating performance. Observing behaviors and using available technology to help track performance can take some of the biases out of the rating process. Thanks. This article was really helpful.